are eaten, your belongings are stored and where you can even entertain guests. The design needs to accommodate the activities you do most in this room, which makes kitchen remodels so popular. Ultimately, the changes that can be made in the kitchen are endless, but by answering three simple questions, you can get a better idea of the things your family wants and needs in the kitchen of your home. First, determine a layout that gives a nice flow. Small spaces do well with a galley layout where most of the space is found vertically. For a larger room, try a u-shaped or l-shaped kitchen with a center island or peninsula that adds function and storage. It also adds an instant eat-in feel by adding a few bar stools around it. Don’t forget that your kitchen needs storage and that means cabinets, drawers and shelves. In order to achieve this goal, use every square inch of space that is there. After these preliminary things are determined, you can now decide what fixtures, countertops, paint color, tile and flooring you want in your room. Ultimately, the options are endless! For this kitchen remodeling project, we added granite countertops and custom built to fit cherry cabinets. The client also wanted a ceramic tile backsplash with dark time inlays and rustic plank floors. They upgraded all of their appliances to the modern stainless-steel variation with a cook top that is built directly into their island. For plumbing, we added an undermount sink with a stainless steel faucet. Recessed lighting and two hanging lights over the island were also installed. 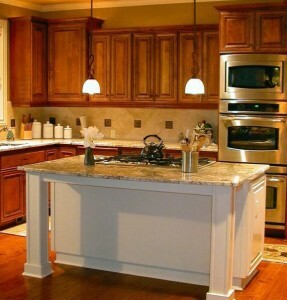 With your design kitchen in mind, we will customize your cabinets in your choice of wood, color and style. These cabinets include European hinges, rollout shelves, easy undermount drawer glides and Lazy Susans for corner cabinets, with your choice of hardware.